Definition - What does Tubal Factor Infertility mean? Tubal factor infertility occurs when there is a blockage or narrowing in the fallopian tubes that stops sperm and egg from meeting or prevents a fertilized egg from reaching the uterus. Tubal factor infertility is thought to account for 25-35% of all cases of infertility. In order for pregnancy to naturally occur, an egg must travel from the ovaries through a fallopian tube where it is met by sperm. If sperm cannot pass from the uterus to the fallopian tubes, the egg cannot be fertilized. Alternatively, the egg may be fertilized while remaining in the fallopian tube, but not be able to travel to the uterus, resulting in an ectopic pregnancy which cannot be carried to term and which may threaten the life of the mother. Rarely, a naturally occurring congenital (from birth) malformation may block the passage of eggs through the fallopian tubes. Tubal factor infertility may be diagnosed through a number of imaging techniques such as a hysterosalpingogram or hysteroscopy. 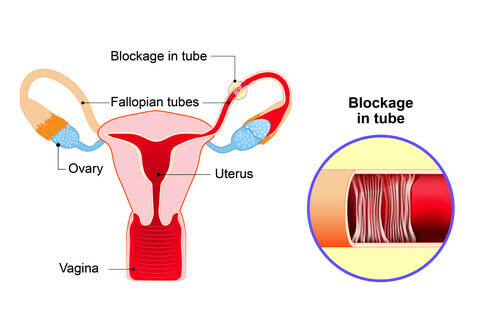 Because fallopian tube problems can be subtle and difficult to detect, infertility with no other identifiable cause may be assumed to be due to fallopian tube blockage. Because any surgery to the fallopian tubes could cause the creation of more scar tissue, tubal factor infertility is most frequently treated through in vitro fertilization (IVF). With this procedure, eggs are removed from the ovaries and fertilized in a lab. The resulting embryo(s) are then transferred to the uterus, bypassing the fallopian tubes altogether.